Tumor markers have become increasingly important in the management of genitourinary malignant neoplasms. For the purpose of this discussion, I will use a broad definition of tumor markers that is based on their potential clinical use. With this perspective, a tumor marker may be defined as any biochemical, hormonal, or immunologic assay which provides information regarding the diagnosis and/or prognosis of a malignant neoplasm. In addition to the obvious potential clinical importance of tumor markers, they may also prove to be useful tools for basic scientists in the study of the pathophysiology of human malignancy. Tumor markers may be highly specific for a given neoplasm or may be quite non-specific. 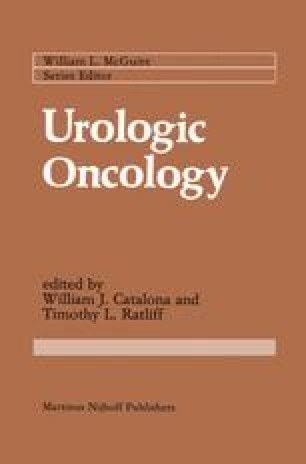 However, their clinical relevance, which does not always correlate with specificity, will determine whether they will be incorporated into the urologic oncologist’s armamentarium or not. A number of factors will determine whether an individual tumor marker will be clinically accepted. Obvious relevant factors include the prevalence of the neoplasm; its actual or perceived impact on the population at risk; and the sensitivity and specificity of the tumor marker itself. Sensitivity refers to the accuracy of the tumor marker in detecting neoplasm when it is actually present. An insensitive test will produce false negative results, i.e., failure to detect neoplasm when it is actually present.